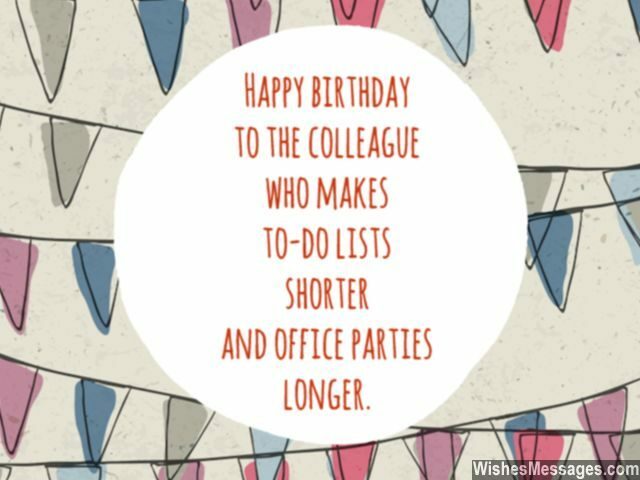 Birthday Wishes for Colleagues: Go beyond the basic professional etiquette and do something more than just a measly greeting card on your colleague’s birthday. Write a sweet quote on a note and put it on your colleague’s desk before he or she gets into office in the morning. The message should be quite clear – letting your co-workers know that you value their support, ideas, help, team spirit and guidance in your everyday work life. If your relationship has bloomed into a strong friendship, go the extra mile with cute posts on Facebook. Send a barrage of funny texts and share heaps of stuff on Pinterest to show that you really care. Remember, that in the long run it pays to build bridges and make friends at the workplace. 1) Happy birthday to the colleague who makes to-do lists shorter and office parties longer. 2) The best part about having a colleague who is more of a friend, is that I can be myself and never have to pretend. Happy birthday. 3) None of the shops had a greeting card for a colleague and best friend, both in one. So I made my own. Happy birthday. 4) Many people have the ability to create a professional atmosphere in the office but very few colleagues have the ability to make an office feel like home while staying professional at the same time. Happy birthday to one such fantastic co-worker. 5) I know that nothing can come in the way of me and a promotion, because I have a colleague who is the ultimate source of motivation. Happy birthday. 7) Happy people like you make me happy to come to work every day. Happy birthday Mr Happy. 8) If we didn’t have a colleague like you on the team, completing projects would have been a wishful dream. Happy birthday. 9) Happy birthday to the colleague who removes the blues out of Monday morning and adds vibrant hues to Friday night drinks. Have a good one. 10) Never do I have a dull day in the office, having a chirpy colleague like you around is a bliss. With a smile brighter than the clear blue skies, colleagues like you in short supply. Happy birthday. 15) I am glad I have a helpful colleague who has the brains of Scientist and the heart of a Mother. Happy birthday. 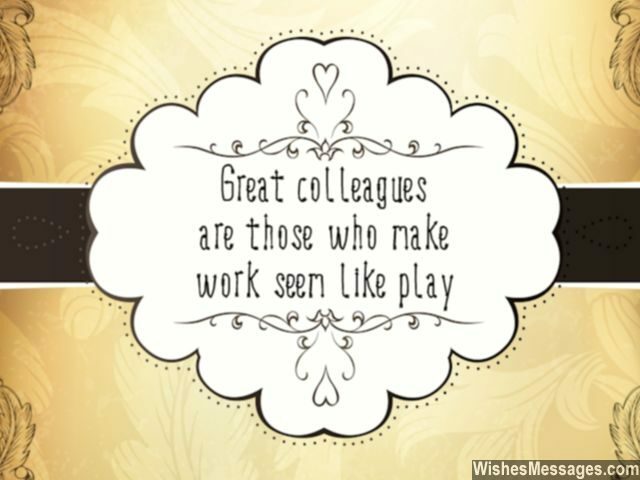 16) Great colleagues are those who make work seem like play. Happy birthday to one such awesome person. 17) Everyone likes you, not just because you are an expert in your domain, but because you happily share your expertise with everyone. Happy birthday. 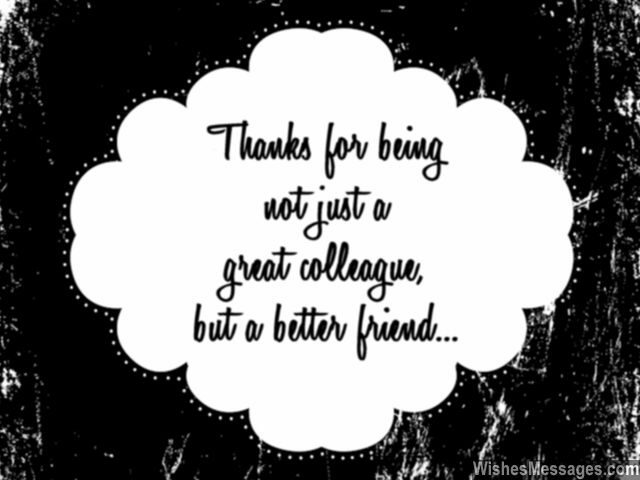 18) Thanks for being a colleague who has given me support and encouragement instead of jealousy and manipulation. Happy birthday. 19) Everyone in the office stands by each other when things are going according to plan. But very few colleagues like you stand shoulder to shoulder even when things go wrong. Happy birthday braveheart. 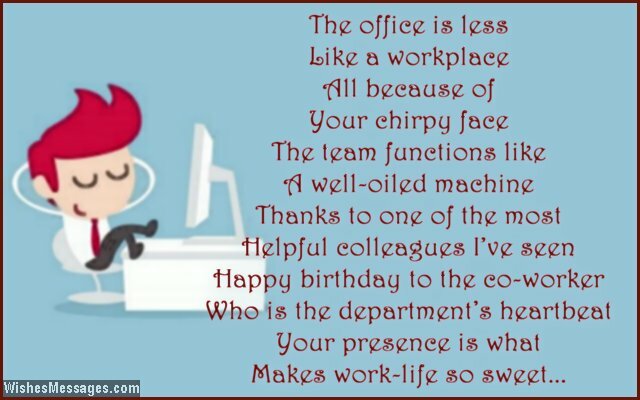 20) Without colleagues like you, workplaces would be devoid of the two most important things – smiles and laughs. Happy birthday. 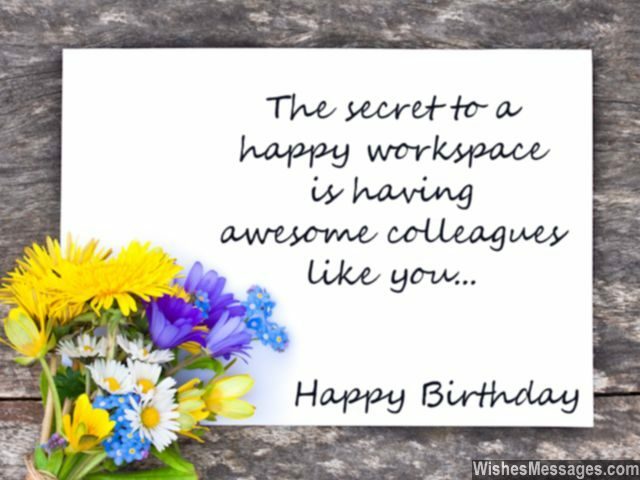 21) The secret to a happy workspace is having awesome colleagues like you. Happy birthday. 22) Motivate and Inspire are words that come in mind when I think about you, because that is what you do. Happy birthday. 23) My wife thinks that there is something fishy when she sees me eager to go to work on a Monday morning. But she does not know that I have a great buddy for a colleague. Happy birthday. 24) I don’t like overtime just because I get paid more. I love overtime because I get to spend more time with awesome colleagues like you. Happy birthday. 25) Some colleagues make decisions, some colleagues find faults, some colleagues gossip and some colleagues tell others what to do. You are different because all you do is focusing on getting the job done. Happy birthday. 26) The office is less like a workplace, all because of your chirpy face. The team functions like a well-oiled machine, thanks to one of the most helpful colleagues I’ve seen. 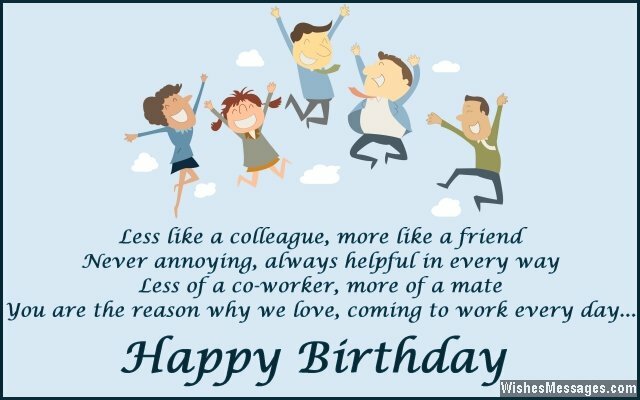 Happy birthday to the co-worker who is the department’s heartbeat, your presence is what makes work-life so sweet. 27) When new recruits are given orientation on their first day, they must be told that they have to aim to become model employees and terrific colleagues like you. Happy birthday. 28) I am successful at what I do, not because I am smart or intelligent but because I have smart and intelligent colleagues like you. Happy birthday. 29) Thanks up for brightening up every day at work by being funny and smart. I always knew that there was something different about you from the very start. Happy birthday. 30) If your cubicle wasn’t next to mine, I don’t think coming to work would have been an experience so fine. Happy birthday buddy. 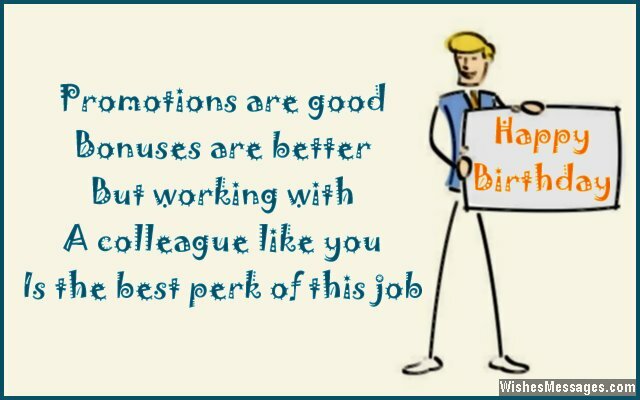 31) Promotions are good, bonuses are better but working with a colleague like you is the best perk of this job. Happy birthday. 32) In the corporate world where competition is cut-throat, helpful and supportive colleagues like you are more important than college degrees. Happy birthday to my man Friday. 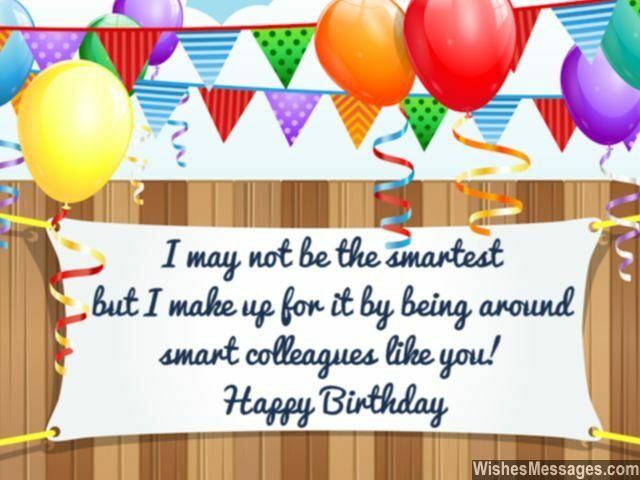 33) Supporter, critic, motivator, teacher, friend and mentor – Happy birthday to a colleague who is literally all-in-one. 34) People list awards, projects, training programs and achievements in their job experience but often forget that all of it would have been impossible without the help of selfless colleagues like you. Happy birthday. 35) Hard work, dedication, punctuality and perseverance are the core elements of individual success, while efficient and helpful colleagues like you are the core element of success for any team. 36) Less like a colleague, more like a friend. Never annoying, always helpful in every way. Less of a co-worker, more of a mate. You are the reason why I love, coming to work every day. Happy birthday. 37) Good manpower is the key difference between good companies and bad companies. With employees like you, no wonder ours is a great company. Happy birthday. 38) It is good to have colleagues who are top performers but it is best to have colleagues like you – who help everyone around them shine out and become top performers themselves. Happy birthday. 39) When I retire, I will not have as many memories of the work as much the memories of the lunch breaks I took with you. Happy birthday. 40) No matter how many contracts we have won, no matter how many projects we have done, if you weren’t in my team my job would never have been fun. Happy birthday.